My name is Mirela or Mimi and live in a small town near Danube in Romania. I've been playing since The Sims 2 launch and now it's my favorite hobby.Think most of you already know me. I love creating for both games Sims 2 & Sims 3 but mostly I enjoy building houses and you can say I'm a builder addict. I't really nice to be here and can't wait to make new friends. 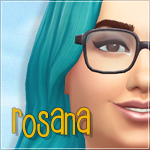 Want to congratulate Rosie for the wonderful work that she's done with the site/forum. Thank you ladies for the warm welcome. I Saw youre tumblr! damn youre creations are nice!! Hi Annabelli. Nice to meet you. Marii thank you.Glad that you like my creations.